The Community Counseling Center had an unprecedented 2018, highlighted by the successful completion of our Golden Anniversary Capital Campaign, which raised $2 million in a year and half’s time! The capstone of the Campaign is the purchase and renovation of the commercial building located at 676 Pismo Street downtown San Luis Obispo. Known historically as the “Greenfield House,” the 2,400 square foot Carpenter Gothic structure is our new permanent location. It will allow us to provide 50% more direct therapy capacity, and additional counseling to over 1,000 clients annually in San Luis Obispo County.The new center will afford CCC ADA parking and access accommodations for clients, and a flagship therapy center in the heart of the downtown’s historic district. It’s a testament to everyone involved that counseling services officially began at the site on November, 26th! The agency culminated the Golden Anniversary Capital Campaign with a ribbon cutting and building dedication ceremony on Wednesday, November 14th from 3pm-5pm at the capital project site. It was announced that the building will be named after the capital project lead donor, visionary and Vietnam Veteran, Mr. Loron C. Cox. Guests were treated to public addresses from local leaders including Reverend, Ian Delinger of St. Stephen’s Episcopal Church; Mayor, Heidi Harmon; District 3 SLO County Supervisor, Adam Hill; and Vietnam Veteran, Loron C. Cox. A lovely host of CCC major donors were also on-hand to share in the one in a lifetime experience. The public addresses were followed by a ribbon cutting ceremony led by the San Luis Obispo Chamber of Commerce. Building tours and light refreshments were provided afterward. ♦ Increase the number of economically disadvantaged adults, couples and families served through community-based clinics by 30%, from 1,200 to 1,560 by December 31, 2019. ♦ Increase the number of economically disadvantaged youth served through K-12 School Programs by 50% (5-17 yrs. of age), from 500 to 750 youth by December 31, 2019. CCC has been working hard to expand K-12 programming and anticipates taking the number of schools sites served from 20-35 sites by December 31, 2019. ♦ Increase the number of economically disadvantaged youth served through community-based clinics by 50%, from 300 to 450 by December 31, 2019. ♦ Leverage California Professional Internship Council (CAPIC) accreditation to increase therapist capacity by 33%, from 100 to 133+ licensed volunteers, Master’s and Doctoral level interns, and Medi-Cal contractors by December 31, 2019. ♦ Enhance and improve information technology infrastructure by implementing the electronic health records system, Therapy Notes, to increase operational efficiency, professionalism and overall program quality by December 31, 2019. The Campaign was launched to provide us with a physical location that will enable us to address critical unmet needs in our community. Going forward, we need your help to serve community members in need of mental health counseling services who are unable to pay, or who pay nominal fees under our sliding scale program. To donate now follow the “make a donation” button below. You may also send a check via mail to Community Counseling Center (CCC), 676 Pismo Street, San Luis Obispo, CA. 93401. To make a direct donation with a credit or debit card please call the main office at 805-543-7696 for assistance with the transaction. CCC is a non-profit 501(c)(3) w/Federal Tax ID #:95-2906369. The Community Counseling Center is a leading provider of affordable, professional mental health counseling on the Central Coast. In order to become the entry point for mental health care services, go-too referral nexus, and professional training hub for master’s and doctoral level clinicians, the Board of Directors has launched a Golden Anniversary Capital Campaign. The mental health care needs of our community are too urgent, and the stakes too high to ignore the crisis of affordable treatment options available to individuals and families. 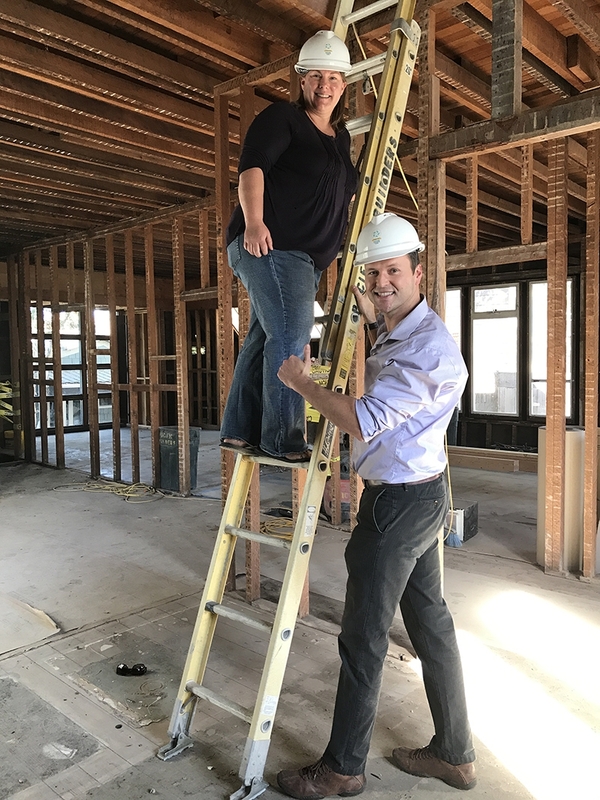 With your help, Community Counseling Center will springboard into the 21st century with a new flagship therapy center and administrative headquarters in downtown San Luis Obispo, upgrade technological infrastructure, and rejuvenate our mission and presence in the non-profit social service sector. 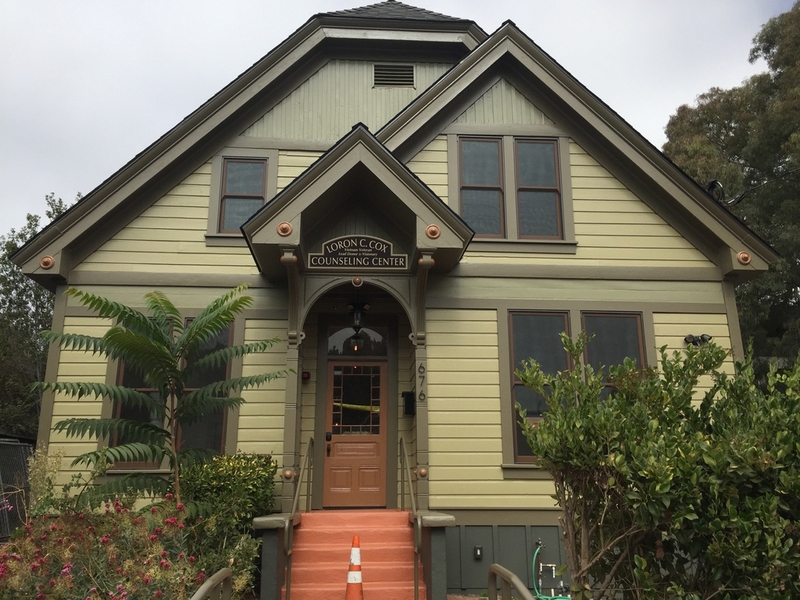 The current lease of Community Counseling Center’s office space at 1129 Marsh Street is expiring in May of 2018 and the Board of Directors secured the purchase of the permanent property as a safeguard against becoming operationally stranded. The acquisition was made possible in large part by the generous lead gift of Vietnam Veteran, Loron C. Cox. In order to renovate this property downtown, grow our services, invest in technological infrastructure, and continue our core program for another 50 years, the agency is launching a Golden Anniversary Capital Campaign. There is a critical unmet need for affordable, accessible and approachable mental health counseling services in our Central Coast communities. Over the past year, we have received the largest number of inquiries and referrals in our history (over 2,200 clients seeking therapy in 2017 in comparison to 600 in 2011). What Does the CCC Need? A New and Permanent Home (and we have found one thanks to the generous lead gift of Loron C. Cox)! The funds to renovate the Greenfield House and finish paying for it. Current technology for client records, finances, communication. Support for our doctoral internship program (CAPIC accreditation). An endowment to insure the financial security of the CCC in the decades to come. $2 Million for purchase and major renovations at 676 Pismo Street, as well as operational infrastructure and endowment. A successful campaign will yield services for 1,000 more clients, training for 50 more therapists, and 50% more program space. 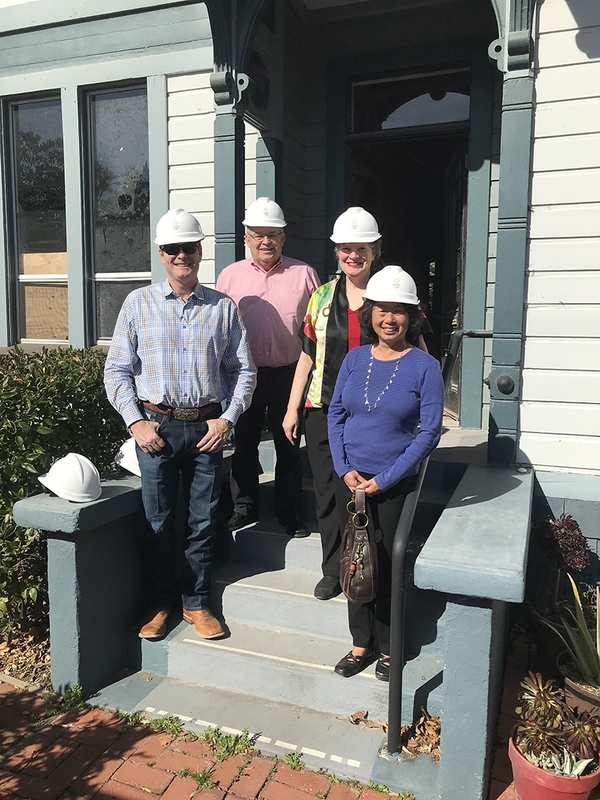 With more than 2,300 square feet, our new clinic at 676 Pismo Street will include seven individual therapy rooms, three administrative offices, a conference room and a reception area. This 40% increase in therapy space will allow CCC to extend our reach to an additional 1,000 members in the community, and train and involve an additional 50 volunteer therapists. Parking and accessibility has been expanded thanks to an agreement with St. Stephen’s church. Connecting with the current Reverend, Ian Delinger has brought the history full circle, as it has been Father Ian and Vestry Board Member Raymond “Bud” Zeuschner that were enthusiastic and supportive of the mutual benefits that could come from being neighbors again. As St. Stephen’s celebrates their 150th anniversary there is a fitting numerology and perhaps one could say, cosmological energy, pulling the two heritage organizations together. Architecturally speaking, the building has a high pitched Jenkins-head gable roof. The structure has many unique characteristics including a triple gable front, horizontal stick work, a cross gable and steep roof. The most prominent feature is the entry with a recessed square porch. A wood arch with a keystone and brackets support an ornate gable. Pierre Rademakers’ external paint design is creating a sterling finish to the Greenfield House! 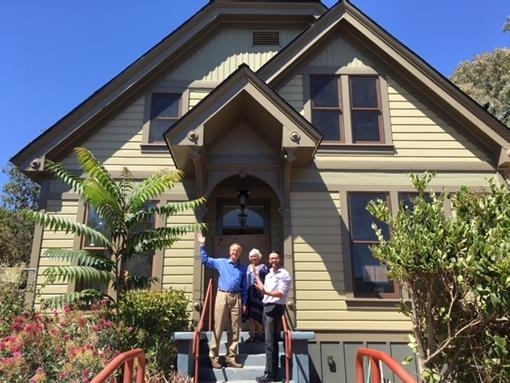 The Community Counseling Center is a “heritage non-profit,” founded in 1968, that can now proudly say it is the owner of a “heritage house” located at 676 Pismo Street downtown San Luis Obispo. Known historically as the Greenfield House, the two story wood frame structure was built in 1892 by Canadian born butcher, Clarence T. Greenfield and his wife Ella. The Greenfield’s purchased the lot from John Michael Price, and subsequently added onto the structure in 1903. Located in the Office Professional zone, the Greenfield house will be the future flagship therapy center and administrative headquarters of the agency. As fate would have it, the Greenfield House is located adjacent to St. Stephen’s Episcopal Church, the original office location of the agency from 1968-73. This generous sharing of office space was thanks in large part to the sponsorship of Ministerial Association member and the Reverend of St. Stephen’s, John Fuller. In fact, the credit for forming the Family Services Center, as it was originally named, goes to the Ministerial Association and its pioneering advocacy for affordable mental health counseling services in San Luis Obispo County. As a result the agency has been a model program for engaging and training professional volunteers ever since. Construction Progress: CCC is making new gains and headway each week. Enjoy the timeline of photos from the beginning of the campaign and construction to it’s current point. There truly is no time like the present. Every gift makes the difference between direct services for those in the greatest need. Your donation now truly matters. 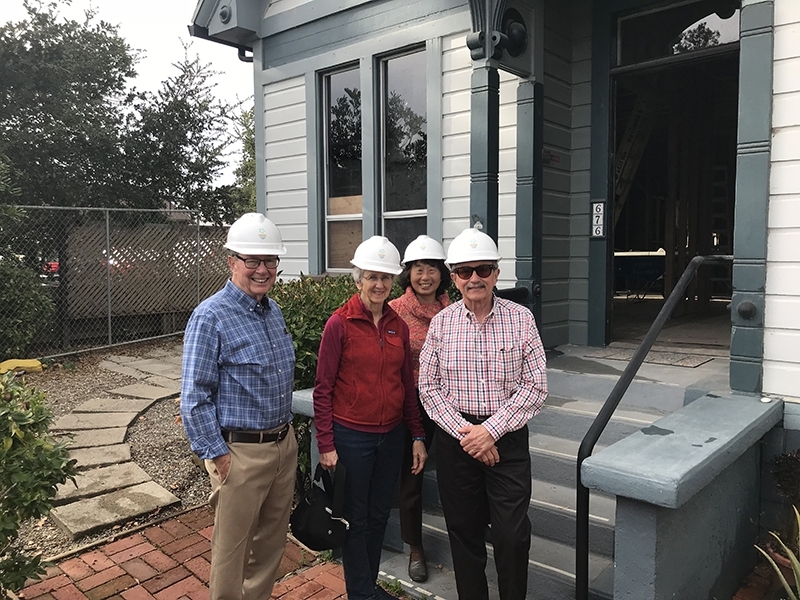 Every donation is an important step towards opening the doors of 676 Pismo Street and the new Community Counseling Center flagship therapy center, and is 100% tax deductible. For major gifts, naming opportunities or multi-year pledges of support, please contact James Statler, Executive Director, at (805) 543-7969. 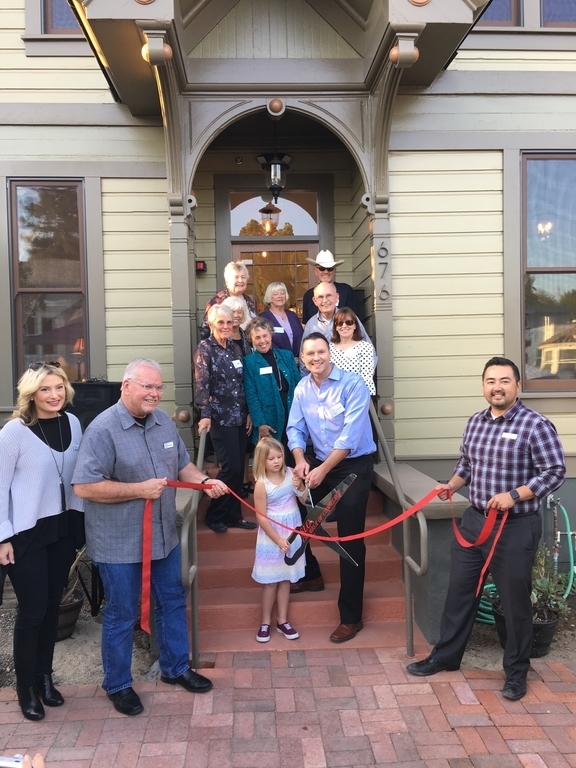 Thank you again for being in our corner and helping actualize Community Counseling Center’s new hearth and home, the Greenfield House, downtown San Luis Obispo.